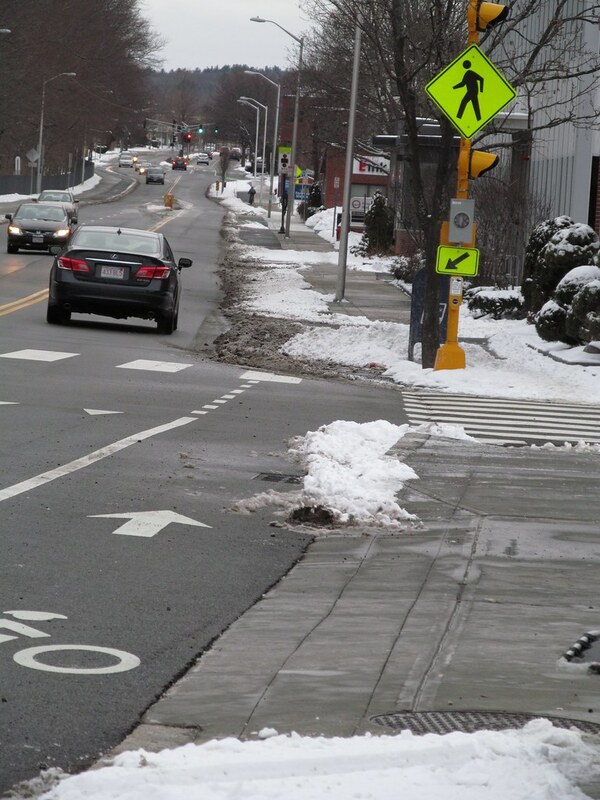 I spoke at a recent meeting of our town’s selectmen about a proposed bike path, and mentioned how planners often have a blind spot about what people on bikes actually want. And to be clear, this is not “what they should settle for” or “what they deserve” or “their fair share” — this is what they want, or at least what I appear to want — and if I don’t get what I want, then I’ll ride somewhere else, or not ride. These examples are routes that I ride from time to time where I have a choice, and what I chose, and why I made that choice. The first example compares two routes across the edge of Harvard Square, one using alleged bike routes on Garden, Cambridge, and Broadway, versus the one I take, that uses a stub of Concord Ave, cuts across Cambridge Common, then in front of the Littauer Center, across the Science Plaza, then onto Broadway. The route I take has no cars, but does have plenty of people, sometimes children, and at times I have had to ride for a minute or two at a walking pace (I have video) or do a sharp stop for a child (I have video). If I had to spend two minutes at a walking pace every day I might find another route, but that is not usual. Why do I prefer this often-slower route? (I’ve measured, it is, by maybe 30 seconds, i.e., the delay of not quite making a green light in Cambridge). In the next section, marked in red, bikes and cars go into an underpass together. In theory the bikes have their own lane, but in practice cars frequently swerve into that lane (video), sometimes when it also has bikes in it. The grooved pavement makes it very noisy, too. Sometimes cars are changing lanes there or swerving around stopped traffic, and that is also unsettling and probably dangerous. If Cambridge were willing to reinforce the painted lane separator with Jersey barriers I’d be more interested in taking it, but for some reason that doesn’t happen (I think that drivers and I both fear that they might drive into the bike lane, and have different feelings about the function of Jersey barriers should that happen — i.e., not only does it feel dangerous, but the use of mere paint in such a scary place makes it clear where bicyclists fit in the safety hierarchy). The return route is marked in orange, it has the same problems as the red. In Belmont, there’s a marked bike path on Blanchard that gives the impression that this would be a good place to ride a bike. However, I prefer a different route if I am riding past Concord, especially if my destination is the bike path to Alewife or the businesses near the intersection of Blanchard/Brighton and Hittinger Street. (The arrow marks drawn on the road indicate a grade). Blanchard is somewhat narrow, yet drivers get the impression that they can move relatively quickly on it. The curbs are sharp-edged granite, which could cause serious injuries in a crash. It feels unwelcoming and unsafe. Bright Road, in contrast, is wide, and traffic is a little slower. It does include a small hill (Blanchard dips, and then rises, so about the same). Across Concord, Blanchard continues to be narrow and trafficky, where Baker is residential and has slower and less traffic. Continuing across Concord, it’s also instructive to notice how drivers cut the chicane so close that the have scrubbed all the paint off the edge of the road. Is that a safe place to ride a bicycle? So I prefer to ride elsewhere. To ride from Belmont Center to Arlington Heights, the fastest way (saving a few minutes) goes up Belmont Hill and then up Park Avenue into Arlington. This is a steep climb that not too many people do. One sometimes-recommended route is to go up Clifton, to Prospect, to Park. Most of the car traffic, however, also goes up Prospect, and it is narrow and also has sharp-edged granite curbs. A slightly longer route is to continue on Clifton and then up Rutledge. This has several advantages. First, the climb up Belmont Hill is hard, but the section of Clifton after the rotary is flat and gives you a bit of a breather. That route also has much lower traffic (hardly any at all) and no curbs, not that you feel much risk of a crash anyway. Here are two routes where I have a mild preference, but less experienced riders would probably have a stronger preference. The apparently straight route is Concord, however the higher traffic makes it much less pleasant. Concord is narrow, in the first part (climbing from left to right up to the intersection with Huron), but generally I can squeeze through. There’s also an additional light, compared to Garden. Garden has much less traffic, which is good and bad. It’s good because it’s not usually necessary to squeeze into tight spots, it is bad because sometimes drivers have an expectation that they should be able to zoom! up or down the road, and will sometimes honk at you for no reason other than you are “in the way”. The fewer lights on Garden are also somewhat more “hackable”, if you happen to be in an inbound hurry. At the intersection with Huron, if you miss your light (easy, it is run by a sensor and cycles quickly if you are not traveling with cars) you can veer left across the fire station parking lot and cross with the last of the traffic from Sherman. At the Linnaean light, the road on the right is very lightly traveled and you can either safely run the light after stopping and looking, or dismount and jaywalk (the socially acceptable way to run a red light). Where Garden and Concord join, the plan is to bear left across the sidewalk onto the stub end of Concord. This is not easy to do if arriving from Concord, but if you arrive on Garden, the light makes it easy, and you also have the option of crossing over to the sidewalk early if you can pass through a gap in traffic. Traveling westthrough Harvard Square on official bicycle routes requires a bit of a detour, shown in yellow. A shortcut that is possible if the lights are favorably timed is shown in red — take a U turn immediately after the north point of the pedestrian plaza and join the auto traffic there. I decided that was not safe enough and now tend to use the route shown in green, walking where it is dotted. This probably saves time over the official route, and is probably also safer. I can’t quite put my finger on it. It’s the Vassal-Huron-Sparks-Brattle-Hawthorn route from Fresh Pond to Harvard Square. My other gripe is that the return route does not use the same roads (because of one-way streets, among other things). If Lake View Avenue was made two-way-for-bikes, the to/from routes could be mostly the same, and it would have only two stops and one light. To be fair, my favorite route to Concord Avenue (the one I recommend to other people) also includes five stops and a stop light. One is officially inbound to Cambridge, the other is officially outbound from Cambridge. The two tracks are on opposite sides of Concord Ave.
On one side, we have an almost completely unbroken cycle track adjacent to a sidewalk. There’s only one place on the whole stretch where a car might drive across it. Together they make a great wide flat space, and when it snows, it is plowed. On the other side the cycle track is cut several times by cross streets and driveways, and sometimes it is level with the sidewalk, sometimes it is level with the street. It is not plowed. 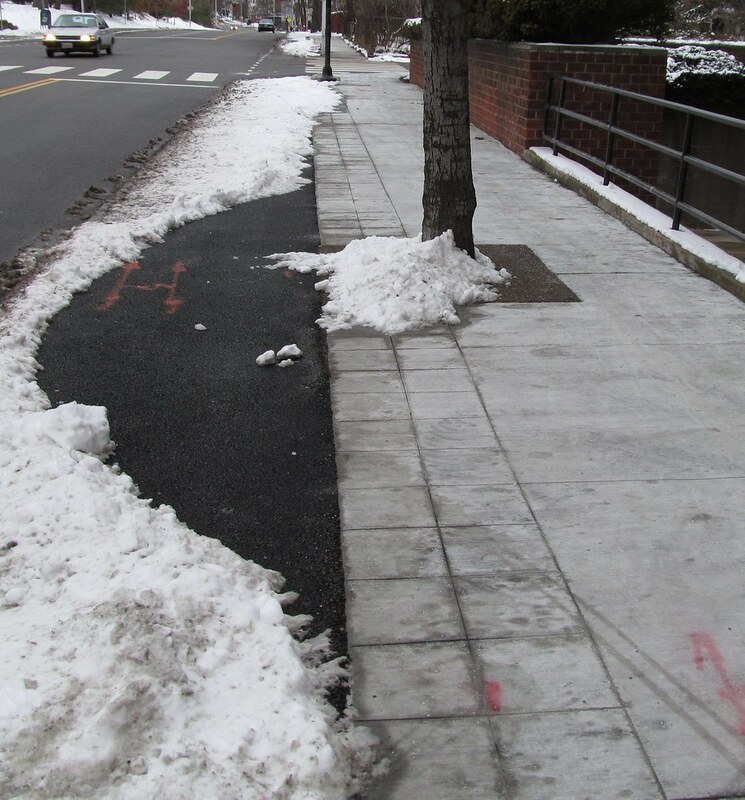 The plow didn’t fit on the sidewalk, so they plowed the cycle track here, but only as long as they were forced to. I have to wonder, what they heck were they thinking when they built this second cycle track? 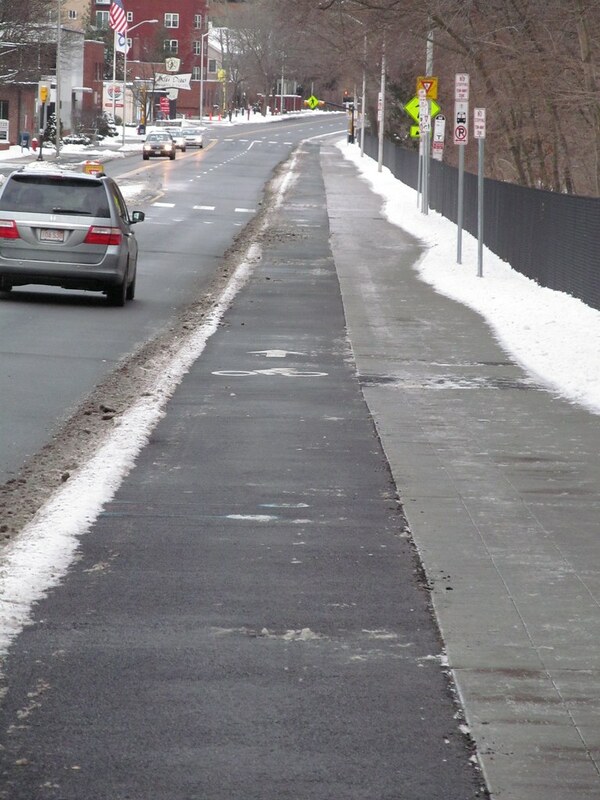 Running bicycles across driveways and cross streets is a recipe for accidents, and after spending all the money to build this thing, they don’t even plow it (and when it’s not covered with snow, it’s often full of gravel and sand). Why waste the money? Why put those arrows on both sides to attempt to guilt cyclists into doing something unsafe? The inbound side is safe and attractive, why not just shift the whole road a few feet and put both directions over there? Burlington (Massachusetts) or perhaps Nordblom (owner of a good-sized office park in Burlington) has been upgrading some of their roads. Overall, I cannot complain, it is better for me than riding on the Middlesex Turnpike (which is a terrible road; no crosswalks, insultingly incomplete sidewalks, crap in the road, and rumpled pavement). It’s about a 4-inch step, where it should be flush instead. Maybe there’s more asphalt coming? Or maybe the asphalt will be raised later, in a crosswalk hump? Both sides have the step, so it seems to not be an accident. I had recently become aware of how sharply the danger to pedestrians from car crashes rises with speed, but this post at Copenhagenize makes the point clearly, with pretty pictures. The risk of death at 20mph is only 5%, but rises to 45% at 30mph. The only point missing is how dangerous (to others) it is to “fudge” the speed limit. 22 in a 20, that’s not really speeding, is it? Use a very conservative estimate of increased risk for small speed increases (exponential between 20 and 30mph), each 2 mph increase in speed compounds 55% onto the risk — so 22mph has a 7.8% risk, 24 has 12%, 26 has 19%, and 28 has 29%. It’s a big deal. The flip side of this is that adding safety is really cheap; just establish low speed limits where cars might crash into pedestrians, and enforce them, and you’ve made the roads far safer. The Urban Country describes an experimental bike lane made by anonymous stencil artists and other people working with a small collection of trash to mark the “lane”. A woman died at this intersection because a truck lazily cut the corner close and crushed her. Yet, with paint and trash, we discover that there is plenty of room for traffic and trucks, and there is plenty of room for them to turn with space reserved for bicycles, and people will pay attention to an incredibly ad hoc bike lane. It’s sadly late for her, but now that we know how easy it is, what’s stopping our allegedly safety-minded road departments? Via Crap Cycling & Walking in Waltham Forest. 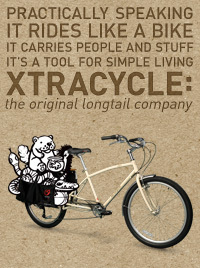 Filed in Nerd (and bike) stuff, Politics, Ride a bike, dammit! Here in the US, we blame the kids, because after, all everyone knows that kids should be more responsible. Other countries, where they would rather reduce the number of kids hit by cars, they fix the infrastructure, and tell the adults to be more responsible. Guess which works better. And the dumbass reporter for the New York Times seems not to know any of this. Just another inflatable doll parroting the words of convention and authority. Or as they phrased it in the Netherlands: “Stop the child murder“. Perhaps you think that’s inflammatory, but guess which country has safer roads as a result. Bike share does not need helmets.